Barry M seem to be bringing out endless new polish ranges at the moment, and we are not complaining! You can see their summer gellys here, and limited edition range here. We were lucky enough to receive the new matte summer collection in the post last week and have been itching to try it out. We had to wait for some daylight to get it swatched for you because the colours are so great we wanted to be sure to show them off properly - still need to sort out that light box! There are six colours in the new collection - Copacabana*, Rhossili*, Miami*, Waikiki*, Cancun* and Malibu*. All are bright, bold, fun and a complete contrast to Barry M's last matte polish range. These polishes were designed to 'drench your nails in colour and style for summer'! Also included in our little bundle was the new Matte Top Coat*, so we put it to the test. I started the swatches with bright pink Miami* and was a little concerned. 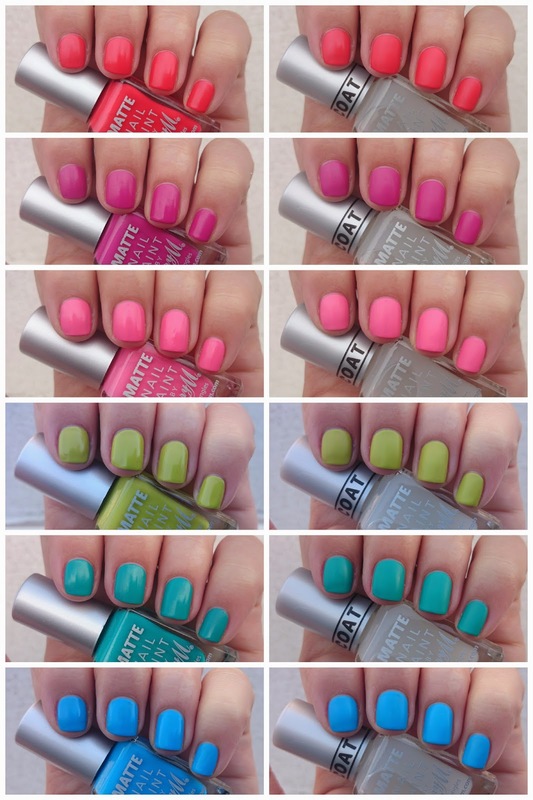 The formula was thick and tricky to use, completely unlike Barry M's usual consistency! Thankfully, it seems this was just an anomaly and we must have got a bad bottle, as the remaining five were perfect. The formula is thin, easy to use and most were opaque in two coats. The only one which needed a third coat was Waikiki*, just to get the best colour density. I was amazed by how well the colours came out with such a thin formula, the depth and brightness is incredible! The collection is matte, meaning that they don't have a glossy finish like the regular Barry M polishes. In the images above, those on the left show each polish without any top coat. As you can see they have a little shine, but compared to regular polish (below) they appear matte. As we wanted to test out the new Matte Top Coat* we applied it to each of the polishes, this is shown in the images on the right. The topcoat makes the polishes totally matte and gives them a nice smooth finish. Although you could easily leave them without topcoat, we would recommend using them with the Matte Top Coat* for an extra matte finish. Alternatively, you can add a gloss topcoat for a high shine finish. As Barry M have such a wide colour range, it was inevitable that this new collection would show some similarities to some past polishes. The wheel below shows how the new range differs from some existing shades. All of these are shown without any topcoat. Blues - As you can see Malibu* is very similar to Cyan Blue, however in the flesh there is a subtle difference. Malibu* is a hint brighter, and has a slight neon edge, which Cyan Blue does not. Corals - So it seems Barry M loves coral polishes as much as we do! There are three other polishes that we think are similar to Copacabana*, one of which is from the new Limited Edition range - Carousel! They all range a little in tone, Passion Fruit leans more towards a red shade, while Coral is more orange and Carousel* is little on the pink side, with an added shimmer. Again, the matte Copacabana* seems to have the edge on brightness - which after all is one of the themes of this new collection! Greens - On first look at Waikiki* we thought it was identical to Key Lime, but putting them next to each other highlights the differences. Waikiki* is a much more yellowy, citrus shade, while Key Lime is more of an olivey green. Pinks - The closest shade to Miami* is Pink Flamingo, but Miami* is more of a Barbie pink, and once again, a few shades brighter! In summary, although there are similar shades available, on comparison the new summer mattes have the edge on brightness every time. They are not quite neons, but Barry M have definitely grabbed onto that trend and created it's brightest range yet! If you're strapped for cash, try buying the Matte Top Coat and using it over some of your existing shades to get the look! We can't choose a favourite from this collection, they are all absolutely stunning, and perfect for summer. If you've got a holiday booked, make sure you get a couple of these in your suitcase, you won't regret it! The range is available in Superdrug (4th June) and Boots (11th June) for £3.99 each. We were very lucky to receive the polishes as a press sample. We're glad too. We have had a bit of a matte love since their winter collection so are really happy with the summer range.